Make gifts for Mother’s Day! Celebrate Spring! Come and learn Felt Making Skills. Sample optimum Felting fibers. Enjoy the abundance of color mixes in projects of any size. Decode the mystery of how light and fluffy fleece becomes a solid, glowing, useful object. 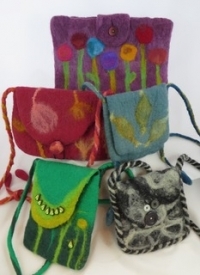 Receive mentored expertise from Beth Leydon, a working Felt Maker and artist. Beth Leydon is an experienced workshop leader. She is a Felt Maker and artist who exhibits her exquisite felt hats, scarves, jackets and accessories locally and regionally. Class size will be limited and Beth will have an assistant, so your project will receive attention and mentoring. You can choose to make either a Journal Cover, a Nested Bowl, or and Cell Phone Case. You will learn felting basics and fundamentals that enable you to go home able do projects on your own. Materials: Bring your own pre-purchased and dyed wool/fleece, or purchase material at the workshop. If you wish to bring your own materials, please check with Beth or Leslie before the workshop on their content so that your project is optimized. Preregistration required, visit www.thecuriousforge.org/event for more information and to register.